News happens fast. Are you prepared (in a moments notice) to deliver a rapid response map to help illuminate an important news story or policy issue your organization focuses on? With their ArcGIS Online subscription, World Resources Institute was. Together using open data, we created a webmap to tell the story behind the Indonesia forest fires this Spring. In a matter of a day, an interactive, embeddable webmap was envisioned, developed, delivered and published to the WRI Insights blog – titled Peering Through the Haze: What Data Can Tell Us About the Fires in Indonesia. Within less than 24 hours, the embeddable map was picked up by international news organizations including Bloomberg, Reuters, Guardian, Mongabay and others. The map was even translated into Bahasa to serve an international audience. As the situation evolved, WRI was able to update the webmap to keep the story current and provide critical insight to the world. 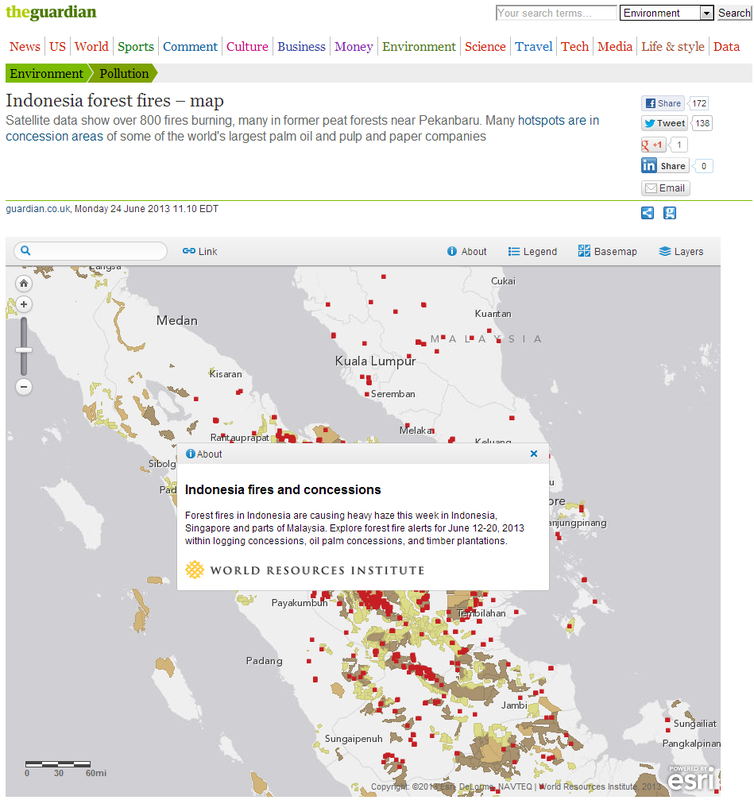 See the WRI Indonesia Forest Fire Map in action and think about how adding a visual element enhances the story behind the event. Learn more in the after action report by Nigel Sizer, Director, Forests Initiative and Global Forest Watch 2.0.